Monumental Sports & Entertainment Foundation hosted an auction during Games 1 and 2 of the 2018 Stanley Cup Eastern Conference Quarterfinals featuring autographed items from So Kids Can participants Nicklas Backstrom, Braden Holtby and Tom Wilson, along with two suite tickets to Game 2. All proceeds will benefit Ronald McDonald House Charities of Greater Washington, DC (RMHCDC). The So Kids Can fundraiser has raised more than $15,500 and counting! MSE Foundation is auctioning off two 200-level suite tickets to Game 2 of the 2018 Stanley Cup Eastern Conference Semifinals on Sunday, April 29, at 3 p.m. 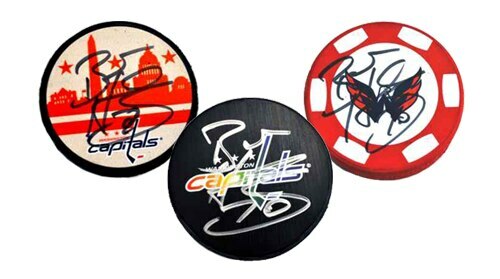 The auction will end Friday, April 27, at 1 p.m., and a limited number of autographed pucks are still available for purchase for $100 each on Handbid. So Kids Can was created in 2008 by former Capitals defenseman Mike Green and Elliot Segal to benefit youth-focused, nonprofit organizations. Backstrom and former Caps forward Brooks Laich joined the cause in 2011, former Caps defenseman Karl Alzner and Holtby joined in 2015 and Wilson joined in 2017. To date, So Kids Can has donated more than $350,000 to charity. Most recently, the 2016-17 So Kids Campaign raised $30,267.88 for Martha's Table. Visit MonumentalFoundation.org for more information. Ronald McDonald House Charities® of Greater Washington, DC, a non-profit, 501 (C) (3), eases the hardship of children's illness on families through programs that directly improve the health and wellbeing of children. Through its three core programs: two Ronald McDonald Houses®, two Ronald McDonald Family Rooms®, and two Ronald McDonald Care Mobiles®; RMHCDC keeps families with sick children together and close to the medical care their child needs at leading local hospitals. RMHCDC programs not only provide access to quality health care, they enable family-centered care ensuring families are fully supported and actively involved in their children's care. For more information, visit rmhcdc.org.